What a difference a day can make. 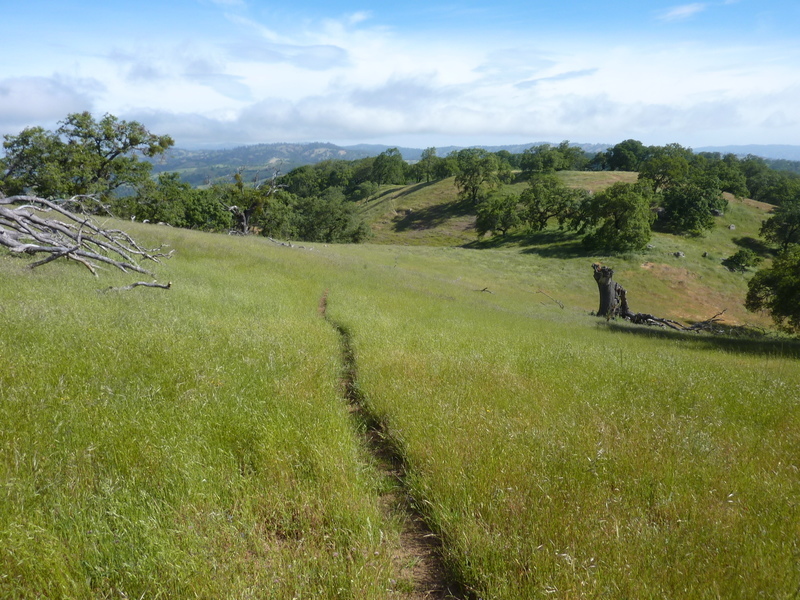 Yesterday I had tried to reach a handful of LoJ summits in the most recent acquisition to Henry Coe State Park, called the Lakeview Addition, only to be rebuffed while searching around for the obscure trail leading to it from Madrone Soda Springs. After going home to lick my wounds, I decided to try again the next day from a totally different direction, starting from Coyote Lake County Park to the southwest. This worked out quite nicely and I had a fine day of it, covering some 17mi while tagging the four summits. While perusing the maps, I noticed that Nesbit Ridge lies inside the Lakeview Addition, a summit I had visited as a night hike two and half years earlier. I had noted that the old roads I used showed no vehicular traffic and would probably be suitable for a day hike. Other roads connect Nesbit Ridge to the other three summits, almost all of them within the state park boundary. The starting point is the dam at the north end of Coyote Lake. I paid the $6 fee at the entrance and drove the three miles to the dam, starting out shortly after 7:30a. Mine was the only vehicle there when I started, but a handful of others would be there upon my return. On the previous visit we had hiked down a road below the dam before crossing the creek at a concrete spillover and starting up the overgrown ranch road. Andrew Kirmse had visited Nesbit Ridge a year ago and found a more direct way up and down by crossing the dam's spillway first. He reported some overgrowth and poison oak encounters which I found could be obviated by simply climbing the steep hillside across the spillway directly up to the ranch road. A barbed-wire fence at the top of this slope marks the county park boundary and the short section of private property between the county and the state parks. Immediately on the other side of the fence the old road is encountered and the going gets much easier. The only visitors on this road, and indeed all the roads I traveled today, appear to be cattle - no sign of vehicles or people tracks anywhere. Some landslides and downfall in several places help ensure that no vehicles will be using these roads without a lot of expended effort to make them serviceable again. The cattle have chewed up the roads during travel in wet conditions, making the roadbeds uneven and mildly concerning when obscured by tall grasses, but still far better than cross-country travel. The larger concern, I came to find, were the ticks that I found along the way. In one section of the road where thistles and grass had grown especially tall, I found more than a dozen on my pants when I passed through. In other places, they were spotted only occasionally, but I kept alert most of the hike to remove them before they could cause any mischief. A few made it as far as my shirt (one of these caused me to stop the car on the drive out to get rid of it), and two managed to get ahold of some skin at the nape of my neck before I noticed them and pulled them out - nasty little buggers. Despite this, they didn't take much away from my enjoyment of the outing. Most of the day's gain was taken up in the first four miles climbing 2,000ft up to Nesbit Ridge. I passed through an unsigned gate, likely marking the state park boundary, not long before turning off the road to follow an easy cross-country slope up to Nesbit Ridge's summit from the southwest. Of the four summits, this was the only one that provided good views off in most directions. It's also the only summit with any signifcant prominence at more than 400ft. From the summit, I followed a well-used cow trail heading north, eventually merging with the old road again in about half a mile. The going becomes fairly easy from this point, without significant gains or losses anywhere until I would be heading back down from Nesbit Ridge hours later. The point identified as Fitzgerald Ridge on LoJ is a mile and a quarter north of Nesbit Ridge and a short diversion from the main route I was traveling. A large cow was startled as I started on this ridge and after a few short fakes to see if I was still following, it eventually went off to join the larger herd that was collected around the small pond to the north of Fitzgerald Ridge's summit. With barely 20ft of prominence, it wasn't much more than a small grassy knoll off the road that descends the ridgeline. I returned to the main road and continued northeast along a connecting ridgeline between Fitzgerald and Cordoza Ridges, following the upper boundary of Cordoza Canyon which drops down in the space between the two named ridges. Cordoza Ridge's summit lies a mile NE of Fitzgerald's, just a few yards from the road that follows along the ridgeline now heading northwest. This is the weakest of the four summits with no views at all thanks to a healthy dose of oak trees surrounding the knoll. The last summit was another 1.7mi to the northwest, oddly named Schoolhouse Ridge. I had thought that this summit, too, was within the park boundary, but apparently not. With the road following below the ridge a short distance on the east side, I encountered a locked gate about half a mile from the summit, then continued another quarter mile to where it meets up with another road on the top of the ridgeline. In the distance I could hear the sound of a chainsaw and hoped it was over at the Henry Coe HQ half a mile to the north. I became alarmed as the sound grew louder when I continued north on the ridge and soon realized it was coming from not far away, less than 1/5mi from the summit I was after. My first thought was that I would have to turn back and be denied, but I'd come more than 8mi and didn't want to give up so easily. With some trepidation, I decided to try moving around low on the west side of the ridge and see if I couldn't make my way unseen to the highpoint. It was a bit reckless, but it worked. I caught a glimpse a few times of a vehicle parked on the road behind where the noise was coming from, and spotted two individuals at work when I peeked through the trees from the summit. Most likely they were working on removing downfall that was preventing vehicle use of the road to the south. It seemed prudent to get back around to the south side as soon as possible to allow my escape before they had finished with the work.